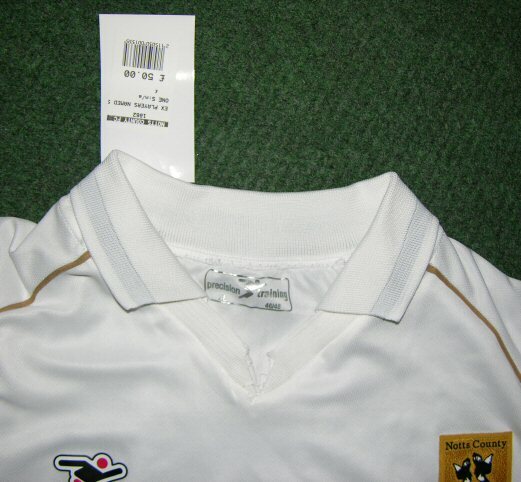 The immediate response of many Notts fans when the clubs new kit was unveiled at the last home game of the previous season against Darlington was that the club had scored a huge own goal by making the design too similar to the previous one. On closer inspection though, the material is much better quality and the addition of the collar was a good move. 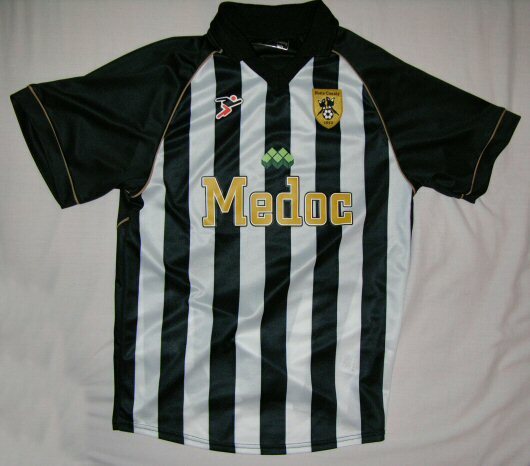 With the team's nickname on the back, and more stripes this is a definite improvement by Precision Training.. Local computer company Medoc were again sponsors. The second kit as it was unveiled at the Open Day in July. Available from the beginning of the season, the shirt remained blue but with a nice trim in the Maggies traditional gold. Another season but,for once, not another manager (well not immediately anyway !). 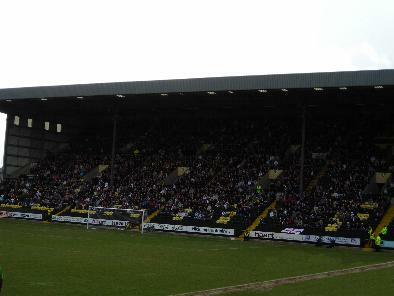 Notts were afforded a rare opportunity of continuity as Steve Thompson remained in charge. 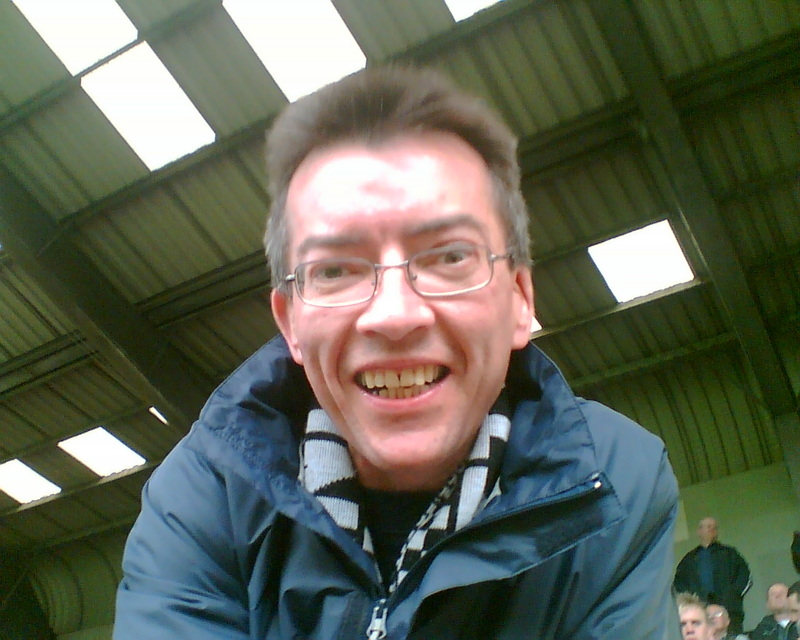 Although the popular David Pipe was allowed to move on, the boss again seemed to beable to persuade some quality names to sign up for the Pies. He competed for, and got, the talented Spencer Weir-Daley, from the other side of the river.Michael Byron and Myles Weston - two of the trio he had brought in the previous season were also persuaded to stay and others like McKenzie and the returning Adam Tann strengthened the squad and gave hope to even the most sceptical that here was a team that could challenge for promotion. However, this being Notts, it was never going to be that easy. An early injury to Mike Edwards made a significant hole in the defence and Weir-Daley wasn't fit enough to start the campaign.Thompson persisted with playing the diminutive winger Parkinson as a striker despite his unimpressive goal total and the Pies failed to score sufficently to kill games off and began with a string of draws. All very last season but with the defence not functioning at capacity, the losses also mounted up at home and away. A broken arm for Lee meant the manager had a chance to acquire the free-scoring forward Danny Crowe on a months loan from Peterborough but on his debut, he broke a toe and the team was left again with the problem of finding a frontman who could regularly hit the target from the limited service they could provide. By now the protests were growing against Steve Thompson and were clearly visible by mid-October when Notts were defeated at Meadow Lane by Bury and a banner accompanied some prolonged chanting from the Jimmy Sirrel stand. For collectors of the matchworn shirts, the recent move towards giving sponsors first pick has been an increasing worry. 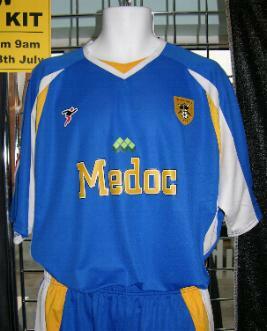 However, the 2007-8 season did provide a few early changes with more current kit cast off than usual. This was due to simple size issues - players opting to go up or down having worn the new ones (homes only) for the pre-season friendlies.This does mean that anyone buying a shirt early on as 'worn' may have got one used only in non-competitive fixtures. 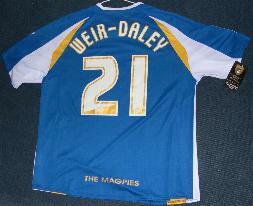 Other players though - Weir-Daley and Lee for example, didn't change until the season was underway. Jay Smith realised, having seen the Austin's shirts, that he could legitimately get 'J' added to his and so chucked out all of his bearing just the surname. In addition, its worth remembering that players were issued four shirts - two home two away and that's before we even get to the third kit so if you have bought an early season 'matchworn' sale, not all of them will have been actually worn.As regards sale at the end of the season, this won't be too difficult to explain (I hope). Edwards,Johnson and Dudfield all threw their home shirts into the crowd after the last home game.Pilks threw Hoult's shirt into the crowd ! New ones were made up for the first two just for the last match.By the time sponsors had had their allocation though, not many homes made it through for sale to the public at the end of the season.Of the aways, the players had the short sleeved ones and the whole of the others went up with all the third kit. They appeared in the shop just after the season ended.Remember the white shirts were only played in once (V Wycombe in October) so only one of the two shirts up for sale would have been worn.If you bought your white shirt near the 9th May when they first appeared and your player was in the squad, you're ok ! After that you'll have to be content with 'match issue'.Quite a lot of players ripped the collar because they were too tight - a sure sign your shirt was worn on that day. The appointment of Ian 'Charlie' McParland as Notts manager and the arrival of his number two David Kevan (also a former player) had the scribes scurrying for a new nickname for the duo. It wasn't long before they came up with a clever epithet that had already seen some use - 'Chas and Dave'. The name stuck and like the club's adoption of the 'Charlie tickets' idea, it was a term that came straight from the fans into common usuage. It's always difficult to ascribe the coining of such phrases to any particular person as once popular, everyone wants to claim it was they who first thought of it. Since the advent of the internet though, its now possible to find out the real author. 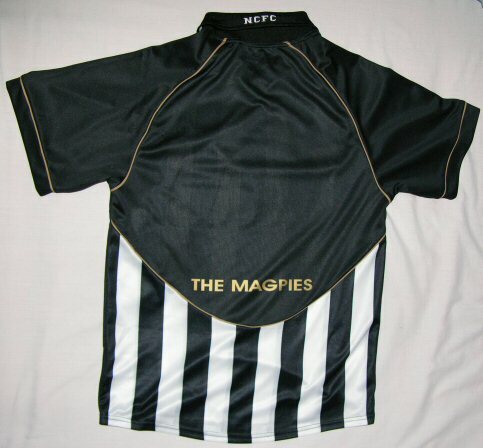 That honour goes to 'Magpie 64' - the pseudonym of lifetime supporter David Skinner of Essex. David made the first reference to 'Chas 'n Dave' on the old Offical Messageboard at 3.54pm on 22nd October 2007 - the day the pairing was announced.It soon spread to other sites and has stuck...gertcha ! There is no difference between player issue and replica for any of the three kits on sale during this season so when you get your matchworn from the shop, you have to keep the tag on ! 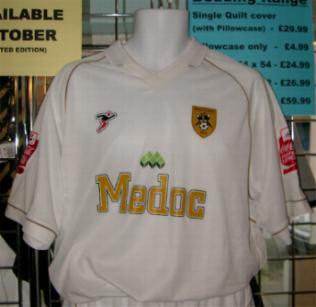 A matchworn white third shirt with a ripped collar - a sure sign it was worn V Wycombe and not just one of the whole available 'match issue' set that also came up for sale.